In the San Francisco Bay Area of California, the Chevron refinery in Richmond is a familiar sight and one that is a constant reminder of the negative health effects that has plagued the community as a result of its presence. Residents living near refineries experience a myriad of health issues ranging from asthma, cancer and various auto immune and respiratory diseases. Unfortunately, this refinery is only one of five in the Bay Area and there is a proposal for a WesPac oil terminal in Pittsburg. In addition to the health risks associated with living near a refinery the people living there are also in close proximity to rail lines that carry crude oil through their communities. These trains travel past schools, community centers, shopping areas and playgrounds. The trains carry potentially explosive crude oil and have a blast radius of one mile, meaning they are continuously threatening the health and livelihoods of the community. A serious fire at the Chevron refinery in Richmond on August 8, 2012 hospitalized 15,000 people, then a little over two years later a train derailment occurred on December 3, 2014 near an elementary school in the same town. Although the train had not been carrying any crude oil, it is an example of the grave outcomes that could occur as a result of careless planning and an example of how some communities are turned into sacrifice zones. 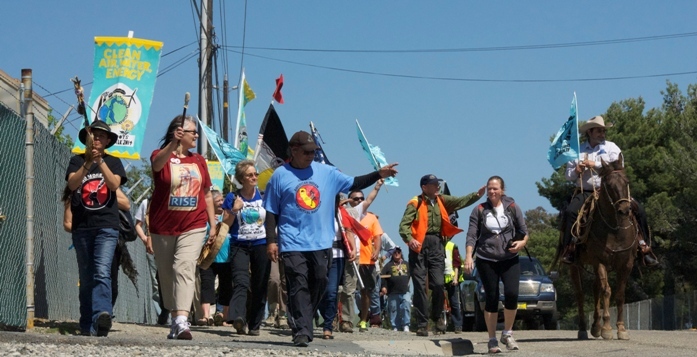 In response, the community has risen with many successful resistance efforts including in January of 2014, a series of healing walks along the San Francisco Bay Area refinery corridor, which were inspired by the many healing walks and runs which included the Tar Sands Healing Walks in Alberta, Canada, the Longest Walks, and the Peace & Dignity Journeys. The walks were held to bring attention and awareness to the health and environmental impacts of the fossil fuel industry. These walks are rooted in old resistance tactics that Indigenous people have used over the years to protest the taking and polluting of their lands. The main organizer of the walks is long time activist, Pennie Opal Plant of Idle No More San Francisco and Movement Rights. Idle No More began in Saskatchewan as a small series of teach-ins that would help people protest bills that would strip away at native cultures and has now become one of the largest indigenous mass movements in Canadian history. This movement spread around the world from the Americas to Australia, Europe, Asia and Africa as groups in solidarity began to conduct their own Idle No More type actions in December 2012. A group of Native America grandmothers, mothers, fathers and grandfathers formally created Idle No More San Francisco Bay. They are one of the most active groups in the movement and are comprised of allies from many different backgrounds. Movement Rights is an organization that works to help local communities exercise their legal rights’ over corporations that threaten the future of the residents’ ability to live in the community in a sustainable and healthy manner. The Walks begin and end with prayers for the water which are conducted by Native American women, and are led by Native American elders and others in prayer following a sacred staff. Walkers stop at the refineries and toxic sites along the way to pray for the land, water and air, as well as creatures living near the refineries and those yet to be born. Support vehicles follow the walkers with water and medics. Participants are asked to sign an agreement to be nonviolent and walkers are encouraged to envision a just transition to a clean and safe energy future and an economy that supports everyone. They are then invited to write or draw these ideas on muslin squares which are sewn together to create a quilt.